Lake Norman Marble and Granite understands the importance of cleaning and protecting your countertops. We now carry Supreme Surface stone care products! Supreme Surface products offer the most advanced cleaning and conditioning technology available on the market today. 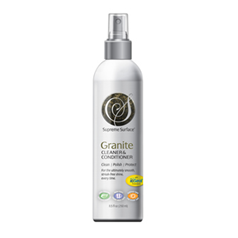 Their line of products come with their exclusive ioSeal protectants which are formulated to be amazing granite cleaners and conditioners. Using Supreme Surface products with ioSeal is a daily treatment, formulated to condition as well as improve the look and feel of your granite countertops, while also protecting them against common issues such as stains, hard water spots, soap scum build-up and more. Supreme Surface cleaners for natural stone are non-toxic and 100% naturally derived. Unlike other granite cleaners and cleaning products for natural stone, Supreme Surface cleaners are designed to clean and polish your stone, and then form an ionic bond with the surface to seal and protect against stains with ioSeal protectants. With every use, you will noticeably improve the feel and reflection of your granite countertops! ← Lake Norman Granite and Cabinetry!